Over the past 10 days I have generally prioritised writing about new brands in our Savile Row pop-up shop. But there are also new developments at makers you will be familiar with - Baudoin & Lange, Luca Faloni, Begg and the Hanger Project - and having these in the shop gives visitors a unique opportunity to see and try the product in person. 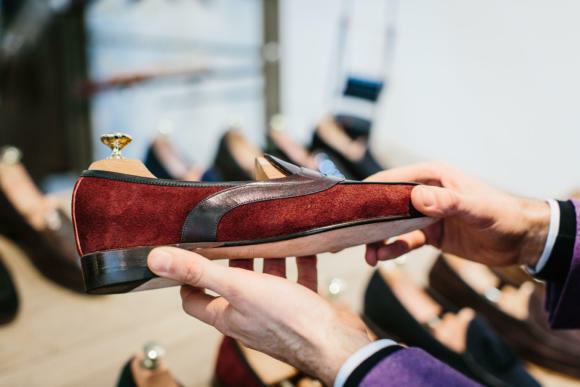 Baudoin & Lange, for example, has introduced three new versions of its Sagan loafer: a tassel, a penny and a bow-tie. I'm not a massive fan of tassel loafers, as regular readers will know, but if they're going to work anywhere it is in a casual setting like Allan's Sagan's. The bow-tie versions are more me (seems a touch more practical, less fancy), but my favourite of the three is the penny. This has a beautiful, sinuous line to it, as the band runs back down the shoe and then curves to the sole. 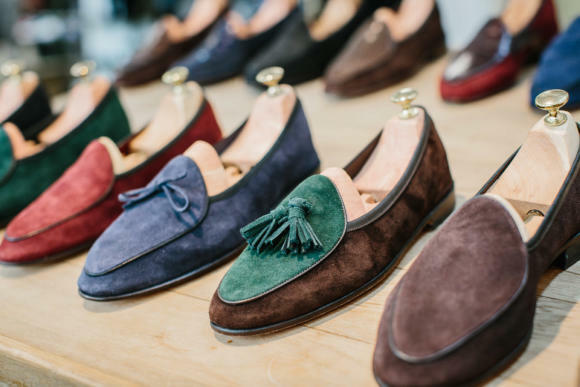 It's one more example of how Allan is elevating the classic Belgian-style loafer, lending it a little more thought and artistry. That extension of the band also has an interesting practical effect. As it is calf, where the rest of the shoe is suede, it stabilises the foot, holding the instep in place while the joints and toes are free to move. If you have particularly wide feet or issues with soft loafers like these, it might be worth opting for the penny on functional grounds as well as aesthetic ones. When I wrote about Luca Faloni last year, it was largely to focus on his cashmere knitwear, which remains a great-value staple. But as the weather warms up, there is more focus on the linen side of his business. There are three styles of linen shirt: collarless and buttoning all the way down ('versilia'), collarless and half-buttoning ('forte'), and with a paramontura collar ('portofino'). Although I would normally have shirts made bespoke, the paramontura or single-piece collar is very attractive in its casual appearance (it is also known as the 'Loro Piana' collar as the brand used to be well-known for them) and the range of colours is fantastic. 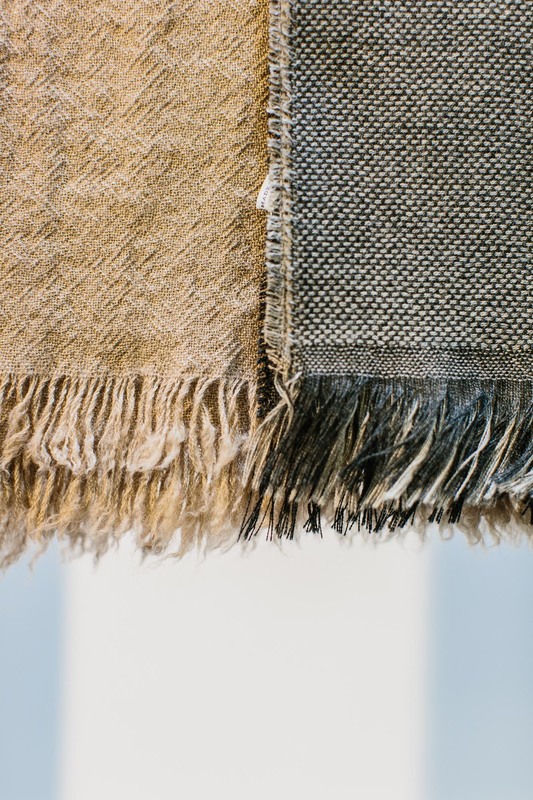 In particular neutrals - white, grey, sand - and the blues - navy, light blue, chambray. The Hanger Project has its range of both hangers and shoecare products on display in our pop-up shop. 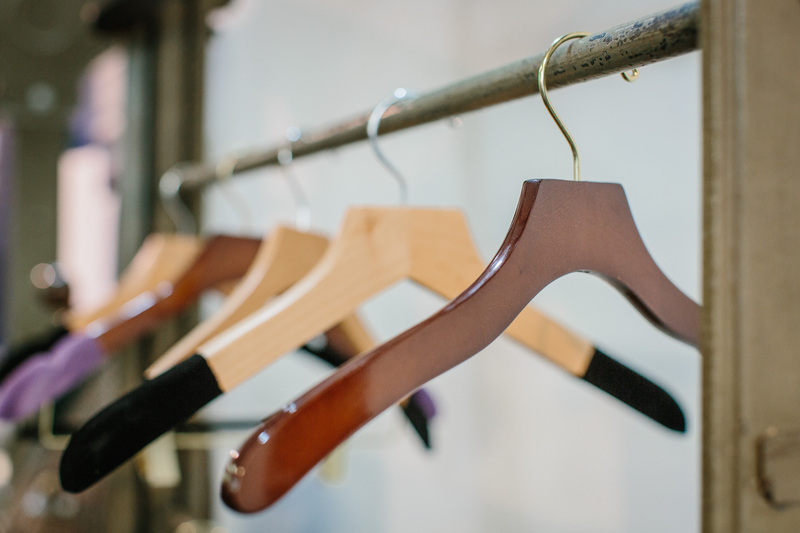 The hangers are largely for display, so that visitors can see the different woods, finishes and styles, and then order online. 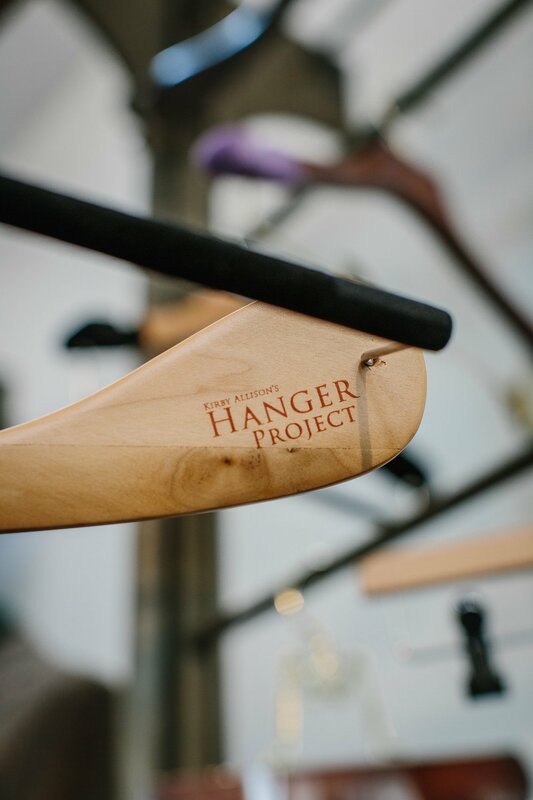 Indeed, this is the focus - highlighting to British visitors that The Hanger Project now has a UK website and warehouse, and can therefore shop these items cheaper and quicker to us than before. There is, however, stock of the shoecare, including brushes and Saphir polish, in case anyone needs to fill up. 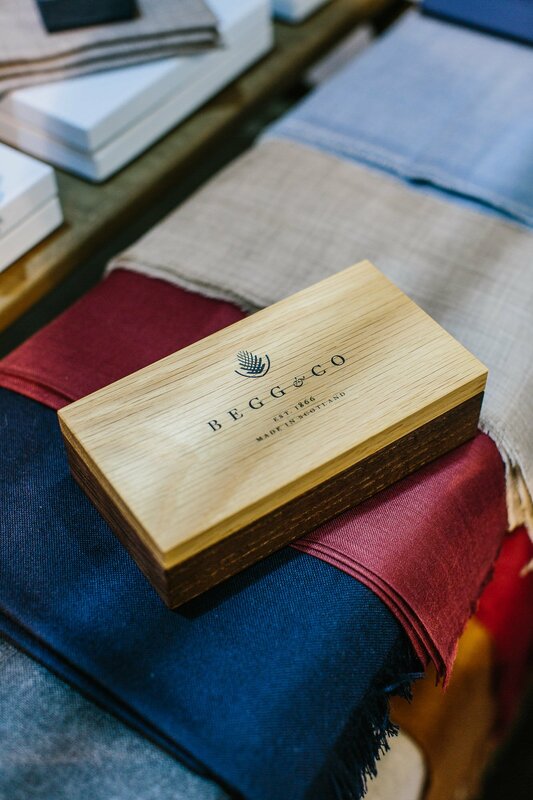 Finally, next to The Hanger Project is Begg & Co, our favourite scarf maker. We haven't focused on Spring/Summer scarves so much here (particularly given the weather) but rather picked out a few of my favourites: the washed kishorns, the wispys in all their various hues, and the nuance style of multi-coloured scarf Begg is particularly known for. 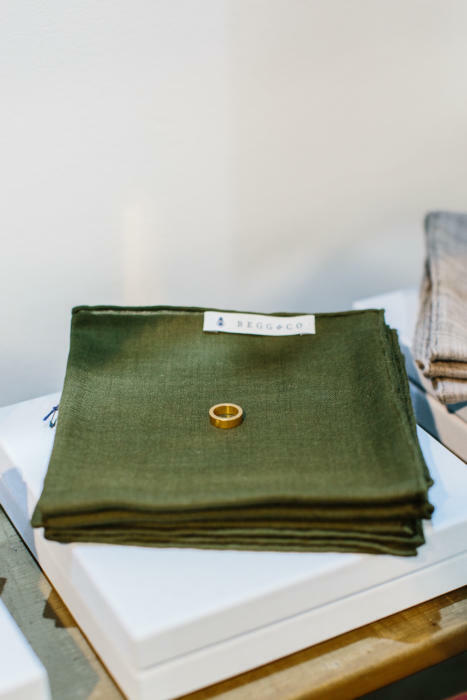 Readers will also recognise the small square scarf I designed with Begg, and our brass scarf rings. Details at all those links! You can follow the discussion on Baudoin & Lange, Luca Faloni, Hanger Project and Begg: PS favourites in the pop-up by entering your email address in the box below. You will then receive an email every time a new comment is added. These will also contain a link to a page where you can stop the alerts, and remove all of your related data from the site. I can’t judge the quality of the Faloni Ltd shirts. But the prices seem rather high being just an agent involved in sale of textiles. I’d rather go to a good shirtmaker where I can choose the cloth and style and know who is sewing the shirt. But of course this is the old decission between RTW and bespoke. How would you wear the paramontura collar, with a summer jacket? In general the ‘Paramontura’ construction helps the collar stand-up nicely and keep the shape longer. I also like the fact that the design remains more clean and elegant (one piece, instead of having the internal band), especially when you keep the first 2 buttons open. 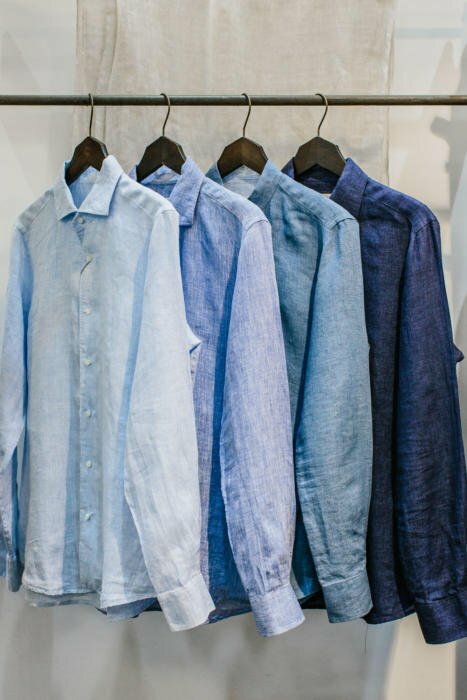 As a consequence it works well under blazers or suit jackets (this is the reason why we used it in the brush cotton, and why we will keep it when we launch normal cotton shirts) and also on its own in more casual use (especially for materials like linen which are more likely to collapse). Looking forward to the launch of the ‘normal cotton’ shirts. Is this imminent? The plan is to introduce 2/3 colours in Oxford Cotton around September or October. It will be same design of Portofino shirt (with Paramontura collar). The idea is to give an office shirt choice for the clients that already know us for the linen shirts. Around the same time we will launch more colours in the brushed cotton. Fantastic post about some of the brands available at the pop up shop. I was thinking of paying a visit today, to checkout those brands I haven’t yet had the time to see. Are you open today until 7 pm? I really like Faloni polos and shirts, and being based in Asia (Singapore specifically), my choice of decent shirtmakers is pretty much limited to a painful process of getting stuff done remotely in Italy (don’t recommend that to anyone…), so I come to rely on RTW of decent providence (Borrelli/Isaia/occasional Kiton), so when I first come to know of Faloni, I was eager to give them a go… Service was nice, delivery was quick…but man, their sizes…XXL is more like M, prob would fit someone who wears size 15 neck. I couldnt even button the shirt – it was running very very small. OK, I am not the thinnest guy in the world but any size 17 Borelli fits me like a glove, all in the right places. Wish they could either get their sizing right or produce bigger options for an athletic build guys. Thanks for your message. As you can imagine (being mainly an online business) sizing is something very important for us and we spend a lot of time on improving it constantly. So I want to reply to your comment to make sure new customers are not confused. Our brand runs a little bit smaller compared to some American/UK brands, but mostly in line with all Italian players (for instance knitwear is similarly sized to a player you named, Isaia), although we are slightly bigger than some other brands (like Cucinelli). For an online business we have a low size exchange rate (and basically nil return rate), with a high repeat purchase rate (on the same size). So our sizes (or explanation of size) are working. And the sizing tables come from decades of experience of the factories/artisans that make the products. Some people do go up one size (especially in the linen), but basically never more than one size (and by the way almost 1/3 of customers that exchange size go down). Having said that, once in a while it can happen that a product is mislabelled, or that comes from a batch that shrunk more in the pre-washing. Although we have quality control steps to prevent that, in some rare occasions it can happen. I would encourage you to compare your item with the sizing table and if you notice any difference please get in touch with customer care which will send you a new item with the correct dimensions. The best way to find the correct size is to use the sizing tables. In the near future we will introduce ‘Fit Finder’ solutions, which based on some simple measurements will give you your likely size, to make the process even easier. On your last point I can confirm that next year we will introduce size 56 on the best selling items. Hi Luca, thanks for the reply, appreciate the explanation…and yes, I didnt bother with the tables, just went with the biggest polo size you had available, figured I’d give it a shot and if it does not work, I’d easily return it. So size 54 it is and it was substantially smaller than Cucinell in slim fit XXL (which I have a few of). No harm done, I’ve gifted it to my brother who couldn’t be happier (he is size L in most brands) and it fits him very well. 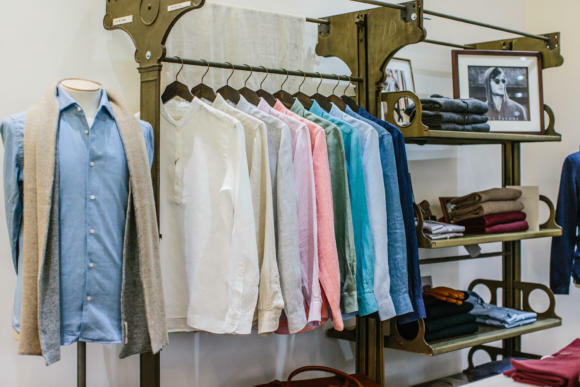 I just wish I could wear half of your collection as the shirts and knitwear look like they are extremely well made and tastefully finished. Please rush in size 56! I know for a fact that we run bigger than Cucinelli, so we must have sent you a faulty item. For instance our size 50 in knitwear is equal to their size 52. A few customers had to exchange for a smaller size after ordering based on their Cucinelli size. So I believe the item we sent you might have been mislabelled. We will get in touch and find out. Thank you for your interest! We launched the new penny design a few weeks ago at the start of the pop-up shop. Over the next few days the new penny version will be posted on our website to be purchased. You can always email us at contact@baudoinandlange.com if you have any specific questions. 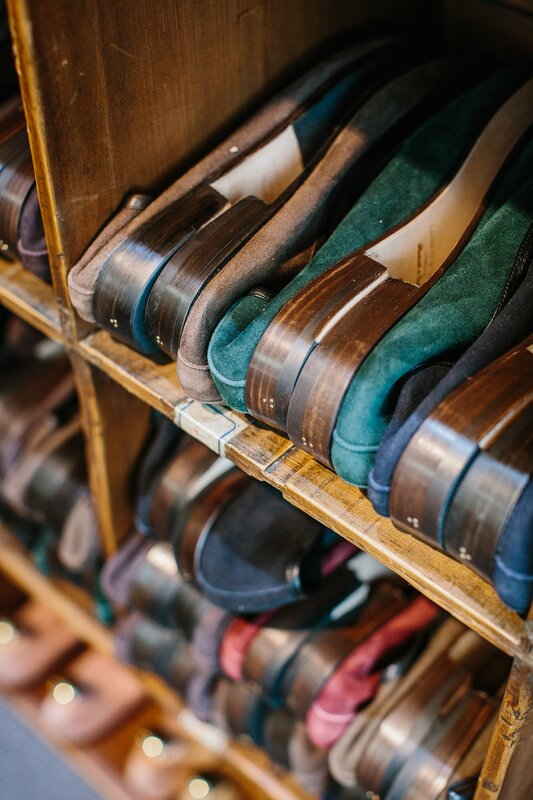 Thanks Bo – I’m afraid impatience got the better of me and I ordered a pair of ‘plain’ Dark Oak shoes earlier this week! Oh well, I never thought one would be enough anyway…. Thanks to you, I became aware of Luca Faloni and, subsequently, a pleased owner of their linen shirts. It is an excellent product and I look forward to wearing them through the hot summers of Dallas, TX. Having worn bespoke shirts form T&A and Charvet for the past 55 years, I have had some experience with excellence. The Faloni products are also top flight. Thought I would add my 2 pence on Luca Faloni for anyone interested. I was in the store the other week and thought i would get sized up for any future orders. I actually was so impressed with the fit I ended up buying one straight away. I normally struggle as knitwear is either too baggy, especially around the shoulders and arms or too tight around the chest. Fit was almost perfect and i actually found myself sizing down from what I thought I would be. They are slimmer fitting that most but not restrictive and on me at least not as slim and snug as a Smedley slim fit in the same size. As a company they do seem to care a lot about fit and at £225 amazing quality. 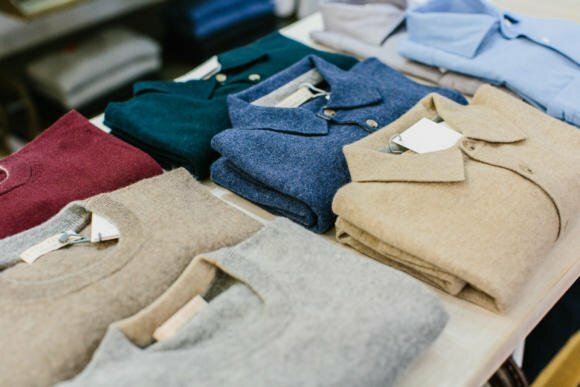 As a comparison I love William Lockie cashmere sweaters which are just a little over that in terms of cost and exceptionally well made. However the fit just means they do not work. I will be buying more from Luca, and want to try the shirts, I am looking forward to seeing the “normal” cotton shirts. (although I have shirts made by LA, sometimes RTW is needed for casual) If I had one criticism of the brand… (although more a compliment that criticism) is they need a bigger range! On your last point, in the next 2 years we will probably stick to the verticals we are already in. We will extend product range in knitwear (colour choices, 1-2 new designs, and maybe different thickness) and we will add some shirts options (same cut in different materials). However we will not enter completely uncharted territories. Reason is that I prefer to improve current design and operations rather than spread too thin. Also I prefer to have less items in more size options and (almost) always in stock, rather than more designs always out of stock. Glad to hear there will be a few more things coming through. As I said it is definitely a compliment, you have some great products and would love to see more. I am actually debating what colour of polo shirt to buy as I type this. Bought more cashmere jumpers as good/better than Loro Piani and super high quality. Luca is a great guy too with tonnes of energy. Thx to Simon for introducing this awesome brand to me. Simon what is the benefit of the hangers from “The Hanger Project”? I get my suits from Whitcomb & Shaftesbury and they come with a wooden hanger. Are they not good enough? I had wanted to buy one of your long-sleeved polos in navy, but alas, I am too late. Do you have familiarity on the long-sleeve polos from Luca Faloni? Thank you kindly.